In 1935, the Bucknell Bison came face to face with the Miami Hurricanes in the first Orange Bowl game, and arose from the storm victorious. Commemorating the game with a shut out of 26-0, Bucknell University surely celebrated this historical event with a triumphant, ‘Ray! 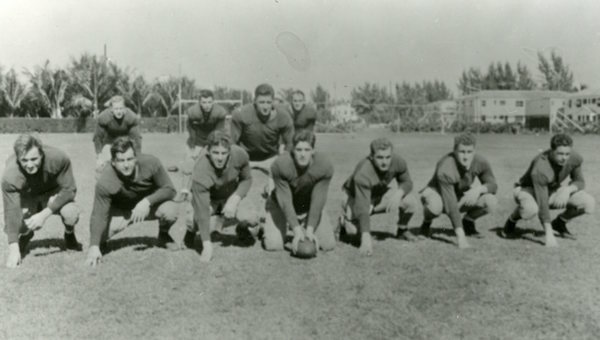 The football tradition of the Orange Bowl game, played every New Year’s Day in Florida, arose from a struggling community in the midst of the Great Depression. This athletic event, originally called the Palm Festival, was to be the medicine the Miami community needed to aid their local economy. In 1933, during the first Palm Festival, the University of Miami upset Manhattan University with an unbelievable victory. During this time, Miami University was poverty-stricken, with athletic teams possessing little talent. The day before the game, the head coach of Manhattan University, Chick Meehan, met with civic leaders of the Miami Community and promised, “I will hold the score down to three touchdowns.” To the community’s shock, Chick Meehan’s team never got the chance to achieve a single touchdown, as the game ended with a score of 7-0 for Miami. The excitement and success of the Palm Festival encouraged continuing the festival, but naming it to the Orange Bowl in 1934. At the time, the only other football bowl game was the Rose Bowl in California, a competition of college football teams representing the east and west coasts. The Orange Bowl would adopt a similar idea, but it represented college football teams from the south and the north with the competition happening in Miami, Florida. The invitation to play Miami University in the Orange Bowl game was extended to Bucknell after they tied a game with Temple University. The Bison were completing their first season under their new coach, E. E. “Hooks” Mylin. After serious consideration, the Athletic Executive Committee accepted the invitation on the grounds that the game would not interfere with classes, and the football team had earned the opportunity to play this special game against Miami University. On December 26, 1934, 28 men, including 22 players, Coach Mylin, and other football/athletic staff left for Miami on what would have been the longest trip “the herd” had ever taken. On January 1, 1935 at 2:30pm, 5,134 fans watched as Bucknell University defeated the Miami Hurricanes 26 – 0 in the first ever Orange Bowl game. There were three Orange Bowl records set in the first game. The Miami Hurricanes competed with only 16 players. Due to substitutions, no team has used that number or less in the Orange Bowl since. Combined, the teams had only 37 players. Miami University players only breached Bucknell’s line for 33 yards from the scrimmage. It was predicted that the Florida heat would impair Bucknell, but the Bison players thrived under the hot sun. The Bucknell Bison team returned to Lewisburg on January 4, 1935. The Orange Bowl game was their seventh win of the year under Coach E.E. “Hooks” Mylin. The game made history not only as the first Orange Bowl – It was also the first time the Associated Press transmitted a photograph from a college football game, making it possible for people to quickly see an image of this historic athletic occasion.